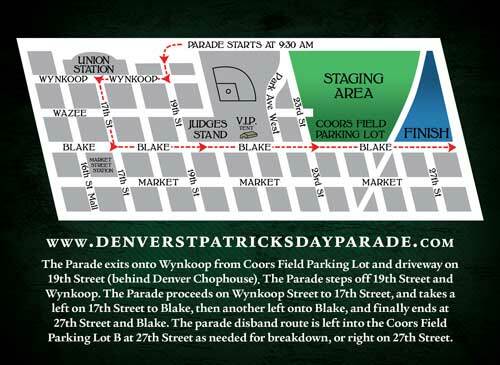 The parade starts on Wynkoop at 19th, turns down 17th street in front of Union Station, and then turns NE down Blake street proceeding all the way up to 27th. Check the Parade Route Map below. Arrive early to stake out your favorite spot! 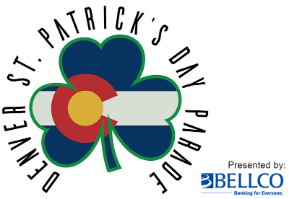 The best place for families is at the end of the parade on Blake Street from 23rd to 27th avenues. March is known for wildly varying weather. It might be cold, hot, who knows! Dress in layers and bring plenty of water. To catch the parade entries full performance (dancing, full music sets, etc.) the best spot is south of 20th avenue on Blake Street (which will be renamed Tooley Street for the Parade). This is probably the most crowded area of the parade and is standing room only. Folks will arrive as early as 6am to stake out a spot. Have fun and enjoy the parade!